The Thanksgiving turkey emerged in national culture with the mass market, and for that timing this unique bird opens a portal into the simultaneous transformations of nature and imagined nationhood that characterized the period. It offers an opportunity for environmental history to more fully meet cultural history. While Thanksgiving turkey imagery recalls a colonial past, it was not until the nineteenth century that turkeys became associated with the holiday, which itself was only then taking on its modern form. Historians of the holiday note the wide influence of Godey’s Lady’s Book editor Sarah Josepha Hale’s editorials in support of a national Thanksgiving. Her hope was that a patriotic, domestic celebration would culturally unify the country as it cracked on the eve of the Civil War. It was not until after the war, however, that the holiday was regularly celebrated in all regions. Indeed, as this chapter argues, it is the post-Civil War decades of industrialization, urbanization, and agricultural expansion that give Thanksgiving, and its turkeys, their essential character. The photograph above showcases the physical quality of turkeys, something forgotten when we think of holidays only as assemblages of symbols. 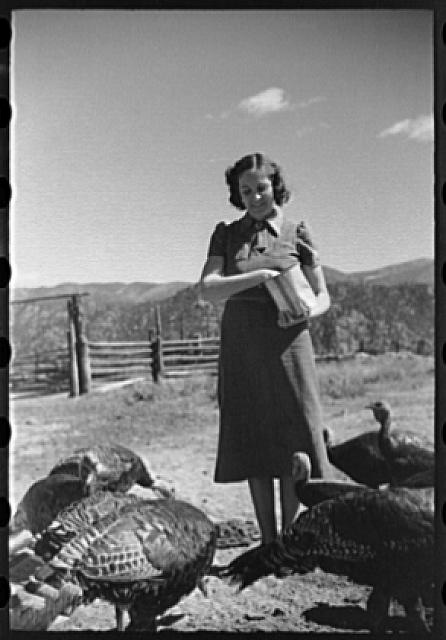 The farm is in Colorado, and it was in the American West that turkey raising met the supply demands of an increasingly consumer culture. In the East, especially in Rhode Island, a liver disease halted turkey production in the 1890s, at which time the country was producing about 11 million turkeys a year. Disease, however, dropped production to a mere 3.5 million for the next thirty years, hardly enough for the turkey to become the symbol of consumer wealth so easily identified in Norman Rockwell’s Freedom from Want. In the West, however, from the 1920s to the 1940s, turkey production soared. This geography of production speaks to the expansionary character of American agriculture, for the West could thrive because it was the next place, the place not yet soiled with disease. It was also a place developed with significant federal aid, which mattered greatly for the turkey industry. From federal irrigation and railroad subsidies, to U.S. Department of Agriculture marketing cooperatives and experiment stations, the turkey industry matured on the scale of industrial agriculture, supported with the government’s assumption that increased production was the moral right of the consumer. The turkey is a wonderful reminder of how that constellation of assumptions and material landscape transformations took place. Indeed, the civic meanings embedded in the turkey, that the nation promises abundance, for example, underscore the interplay between American middle-class culture and the rise of industrialized agriculture. This chapter is the story of how that national culture and industrial agriculture grew to mutually reinforce one another.